Sedona Hiking Adventures was formed in May of 2004. I owe a great deal to Adam Wayne, my good friend and hiking mentor. At the time, Adam was forming his own tour company, called Secret Mountain Adventure Sports Headquarters, SMASH Tours for short. Adam and I are great friends and as he was putting together his business plan, I was watching intently. While Adam was creating SMASH Tours, he and I were talking about putting together a website as an archive for all the photos we took on our various personal hiking adventures. We both came up with several domain names, but none of them were all that appealing. Then it came to me, we’ll call our website “Sedona Hiking Adventures.” I figured that was appropriate due to the fact that we hiked most of the time, most of our excursions took place in Sedona, and hiking with Adam was always an adventure. So I quickly registered the domain name before Adam and I even agreed to the name. Funny thing, we never did get that archive website started for our personal photos. A short time later, Adam hit some walls in his creation of SMASH Tours, so for all the time and work he had put into it, he folded his cards. I was quite amazed that he just gave up, because Adam is a successful business entrepreneur. All the while, I was talking to Adam and listening to his every word about what he was going to do and how he was going to do it. There were even some discussions about me being involved in SMASH Tours. At this point, I made a crucial decision, one that would change my life forever. I decided that the Sedona Hiking Adventures’ initial website would be the foundation and the beginning for my own tour company, one that would specialize in hiking tours and my passion and expertise of Sedona would lead the way. I would like you to know that Adam isn’t my only hiking mentor. I also need to give a ton of credit to his wife, Robin Blakey. She is not only my hiking mentor, but also my dear friend, and the person I come to whenever I have a question about a trail in Sedona. Amazingly, she knows the answer to all my questions. Without Adam and Robin, I would not have had the knowledge or the foresight to form Sedona Hiking Adventures. I thank them both for all their help and support since I started Sedona Hiking Adventures. I grew up in New England, which is so much different than the place I now call home. Everyday when I wake up and see the red rocks, I am thankful of the journey that brought me here. As a child, I grew up in the suburbs of New York City. Not much in the areas of rocks like Sedona or forests like seen in Flagstaff. My Dad and I would go “mountain biking” through the woods in between neighborhoods, and this was back before there were even mountain bikes. We used our good old three-speed bikes and there was nowhere we couldn’t go. We crossed rivers and streams and over logs. This was all really hard back then, but I just loved to be out in the woods. My father and I were always doing something outside. Our explorations led us everywhere. When we were together we were usually doing something outside and in nature. Before I was 16, we had biked from New York City to Jones Beach, Bear Mountain, and Atlantic City. Then I was into biking and spending time outside, but in retrospect, I think I just enjoyed being with my Dad. He taught me a lot and without his years of insight and telling me about life’s little “learning experiences,” there would be no Sedona Hiking Adventures. The morals, values, and ethics, I have to thank my father for. He is a terrific man, and as a child I used to go to work with him often. He owns his own business, a textile converting company, which he has been doing for over 30 years. I would always watch and listen to everything he had to say about business, though now everything he has told me over the years makes so much sense. He is a very smart man. He can sell ice cubes to an Eskimo. It wasn’t until I formed Sedona Hiking Adventures that I realized how powerful everything he told me over the years, well, actually how impactful it would turn out to be in my life, and the formation of Sedona Hiking Adventures. Watching him own and operate his own business made me want the same, but not his business because that’s his passion, not mine. I must say that I did work with him for two years and that too was one of the biggest learning experiences of my life - that is to follow your dreams, not those of others. When I was twelve, I took my first trip to Arizona with my family. We did a whirlwind tour, seeing the Grand Canyon, Petrified Forest, Painted Desert, and much more. As a child, my father told me stories about when he went to the University of Arizona in Tucson, and what stories they were. Perhaps it was those stories and that trip that brought my heart to Arizona, before I ever came here physically. After I graduated high school in 1988, my father and I were on a plane to Flagstaff the very next day. It was there that I first met my good friend, Adam Wayne, and several years later his wife, Robin Blakey. You see, I first came to Flagstaff to attend college at Northern Arizona University. It was there that I realized that my dreams were discombobulated, and I no longer wanted to do the things I thought I wanted to any longer. Arizona changed me, and it is a change that will be with me for the rest of my life. I have some of the best friends that a guy could ask for, people that I met that first week while attending college at Northern Arizona University. It wasn’t until 2004, three years after moving to Sedona, did I realize what I wanted to do with my life. People always say that you should do what you love. Well, I moved to Sedona so that I could hike every day, because I love to hike and I am totally passionate about the red rocks that surround Sedona. I love where I live and I can’t emphasize that enough. That’s when Sedona Hiking Adventures was formed. I designed Sedona Hiking Adventures to take people around Sedona my way. I am an environmentalist and avid (somewhat crazy) recycler, so I share those ideals on many of my tours. Sedona Hiking Adventures is all mine, so I make the rules, and I set the standards. You can hike the trails on your own, and I encourage that. But if you want a one-on-one experience, where I can show you Sedona and northern Arizona through my eyes, then you should consider one of my tours. I don’t claim to know every single detail about the area, but I do know the area very well and I will tell you about it. Hiking with me on a Sedona “hiking adventure” is just that, an adventure! My first and foremost concern is your enjoyment on all my tours. Whatever I can do to make you happy, I will do. Hiking is only part of the adventure. It’s an experience that together we share, where I can interact with you and your family/friends. I strive for excellence in all my tours. I live, work, and play here. I know all about the rocks, the geology, flora, fauna, and natural history. But it is your tour. I’m just an interpreter, call me an extension of the red rocks or a limb of a tree in freestanding motion. I’ll show you as much or as little as you want to see, telling you as much or as little as I have to share. There are all sorts of tours in Sedona. You can pick what’s best for you. If you are looking for something a little more personal, something totally private, then Sedona Hiking Adventures could be just right for you. Don’t fret if you would like to do something that is not listed on my website, as each person is unique, so are all my tours. I would be happy and delighted to customize an adventure to meet your precise criteria. Now you know a little about my background, my tours, and me. There is no Sedona Hiking Adventures’ adventure without my insight. If you have any questions whatsoever, please don’t hesitate to contact me. 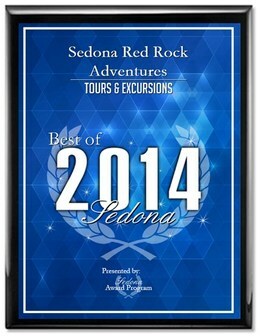 We look forward to meeting new clients, friends and those who like to travel the less traveled path on a tour as unique as Sedona Red Rock Adventures itself. This is one tour you do not want to miss! To share our passion of this sacred land called Arizona with visitors from near and afar; allowing them to experience the adventure, gratitude, and bliss of this magical land as seen through our eyes every day.